USD 420 Superintendent Bill Orth looks over Osage City Middle School’s gymnasium while student physical education teacher Matt Levy shoots baskets to warm up for the next PE class. 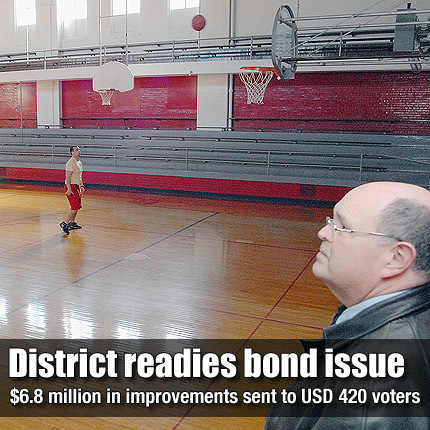 The USD 420 Board of Education included renovation of the gymnasium in a bond issue question that voters will decide in April. OSAGE CITY—USD 420 patrons will be asked to vote on a $6.8 million bond issue April 3, following action taken last week by the board of education. During the Jan. 11 meeting, board members met with the co-chairs of a community steering committee, Casey Mussatto and Bobbie Pearson. The committee has been meeting for more than two years to allow the community to assist in planning projects to be completed with funds from the proposed bond issue. Mussatto and Pearson said the committee had met the week before and had developed a final recommendation to present to the board of education. As recommended to and approved by the board, the bond issue in the amount of $6,772,500 would fund constructing an addition to the elementary school for a library and making other renovations to the elementary school; installing a new mechanical system in one wing of the elementary school; constructing a new middle and elementary school gymnasium, which would also serve as a storm shelter; renovate the existing elementary school gymnasium to serve as a fitness room and access corridor; renovate the existing middle school gymnasium, including installing a new floor and making the gym accessible to those with disabilities; and construct a new track and field facility including seating, parking, lighting and locker rooms. According to Pearson, the committee’s goal was to keep the mill levy increase associated with the bond to less than three mills, but it was understood that adding renovation of the Osage City Middle School gymnasium to the project could bump the mill levy increase slightly above three mills. “I felt the committee last week was very adamant that the full project going full steam ahead is the best idea,” said USD 420 Superintendent Bill Orth. “That’s what they voted on,” Pearson agreed. Mussatto said the committee considered the timing of the bond issue, and the possibility of losing some of the benefits now available. Orth explained after the meeting that according to current state law, the state will pay approximately 45 percent of the bond, but with legislators currently in session, it is unknown if the law will be changed. He said the district is also eligible for zero, or near zero, percent interest on about $4 million of the bond due to a federal stimulus program. Mussatto said the committee had considered those factors. “Anything passed by July 1 is going to be covered by state funding, it’s only after July 1 that we don’t know about,” Mussatto said. Mussatto noted the addition of the gymnasium renovation, estimated to cost about $260,000, caused concern for some of the committee members, but all agreed it was a need that should be addressed. “It was not as clear of what the benefits of that particular project are in terms of value of the building, we just know it’s not as functional as it should be,” Mussatto said. He pointed out the gymnasium was not as accessible as it needs to be, it was not as wide as it needed to be due to the concrete seating on each side, and it had moisture problems. As the board hashed out the language to be included in the bond resolution and on the ballot, they also hashed out whether to include the gymnasium renovation. USD 420 Board Member Todd Peterson agreed. “Before long, that dominates the ballot language to the point you hardly see the library and elementary upgrades. Before long, the money’s not the issue, it’s the perception,” Peterson said. Orth said an option would be to not include the gymnasium renovation and “do that piecemeal” using capital outlay funds over a period of several years. “If board feels like the $260,000 – does putting that on the ballot overbalance what we are looking at as far as education?” Orth said. USD 420 Board Member Ray Lauber said if the board didn’t include the gymnasium renovation, it might be regretted in the future. USD 420 Board Member Cindy Cook said the board should consider the committee’s goal of less than a three percent mill levy increase. Lauber countered that the mill levy goal was an arbitrary number, and the board noted a mill levy increase due to the gymnasium renovation would be .2 of a mill. The board discussed the fluctuation of mill levies, which are based on property valuation in the district. The possible mill levy increase suggested was calculated using valuation from last year. “If valuation goes up, it may be less than that,” Orth said. “I think the board needs to own the fact we’re taking additional action beyond what was recommended by the committee,” Lauber said, referring to the possibility of a mill increase more than that calculated. Lauber’s comments staged the board to vote on the resolution to approve placing the bond issue on the ballot. Peterson’s motion to adopt the election resolution and authorize USD 420 Board President Brian Davies to sign all necessary documents was seconded by Lauber and unanimously approved by the board. “I hope in the eyes of the public we have tried to involve the community, so the community feels like we’re trying to do the best thing for our educational system,” Davies said. The resolution as approved can be seen on page 4B.